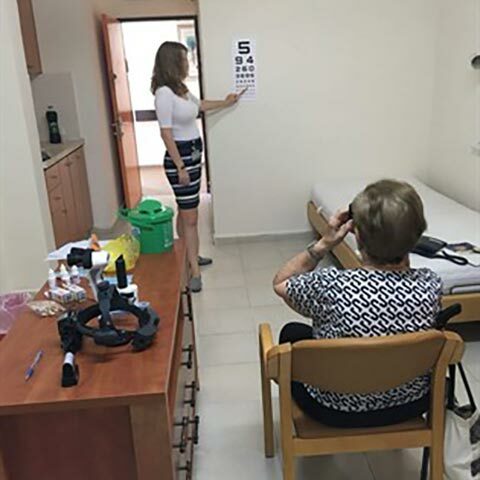 Saving nursing home residents from the burden of commuting to the hospital for eye examinations, Hadassah Medical Center ophthalmologists and optometrists have begun bringing their expertise to the seniors’ home setting. During these special visits to the nursing homes, the ophthalmologist and optometrist conduct screening tests to identify any visual impairments, such as cataracts. If a problem is identified, the individual is referred directly to the appropriate specialty clinic. “The patients we examined were very appreciative of the effort we made to conduct this offsite testing,” relates optometrist Hadas Ben-Eli. Because of mobility challenges and the difficulty of traveling to the hospital, she explains, these seniors sometimes neglect their eye care. “We were extremely excited to help patients with their routine eye examinations and hope to continue assisting them in the future,” Dr. Ben-Eli adds.